As mentioned in a previous article, “Starting Classes with Introductions,” quite a lot of movement and coaching needs to fit into a 60-minute CrossFit group class. 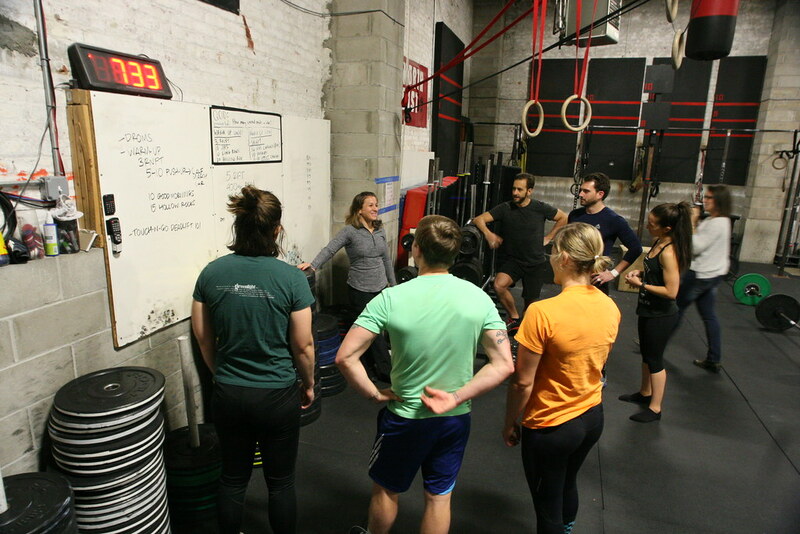 A typical class might include a compilation of three to five segments involving barbell warm-ups, reviews at the white board, WODs, lifting, skill development, and cool downs, etc. Especially as your affiliate grows, you'll need to have consistent and effective time management strategies to get large volumes of people through each class in a clear and practical way. At CFSBK, we constantly use time stamps—by which I mean specific, pre-set amounts of time—to achieve our planned programming within the hour. Below I'll discuss some different class segments we typically use, how long each segment takes, and how we manage the segment’s time limits. As you'll see, we're heavy users of wall-mounted digital timers. If you're only using timers to measure WOD finish times, you're totally under-using them. We have four digital clocks in our gym—one always displays the actual time, and our coaches use the others to communicate time stamps and run WODs. Having multiple clocks is also helpful when running more than just Group Classes at any given hour. To offset some overhead costs, most young affiliates start out with economy bumper plates and kettlebells. The cheapest versions are usually all black, and the more of them you accumulate, the harder it can be for you and your members to properly identify during equipment selection and clean up. Unlabeled 10lb and 15lb bumpers can easily get stacked together and a sea of black kettlebells can lead to lots of individual inspection in a hunt for the desired "pood". Of course, more expensive versions come handily color-coded, which—when you can afford them, especially the bumpers—are totally worth it. As I said in my last post, without offering competitive and sustainable wages, you will not be able to hold onto highly skilled professional coaches. A longstanding tradition at CFSBK is to start classes with introductions and a short Question of the Day (QOD) while we do our general movement preparation. We’ve been doing this since the days when were still meeting in a park and over time, it’s become a staple of our class template. Initially, I just thought it was a nice way to start classes and get people acquainted, but it has since proven to be a valuable tool for setting the tone of the class, learning people’s names, and showcasing the personality of our members and coaches. The QOD reflects the importance we place on both having an on-going, continual conversation with our members, and creating opportunities to foster a sense of community. The fundamental principle behind CFSBK’s pay philosophy is that staff is our most important investment in the gym. Without offering competitive and sustainable wages, an affiliate owner will not be able to hold onto highly skilled professional coaches. Anyone with experience working in traditional commercial fitness facilities has observed the high turnover rate, especially with the most talented trainers. One of my proudest accomplishments since starting our affiliate is our low-attrition rate with staff. In the past five years, we’ve only had one coach we’ve hired leave the gym. Hopefully, that means we’re doing something right, and so I’d like to talk about how we structure compensation for our coaches. Inside the Affiliate is a blog, which I want to use to share what I've learned over the last six years running a CrossFit gym. In the spirit of CrossFit’s open source affiliate model, I'll be discussing our class management principles, continuing education programs, and the lessons my coaches and I have learned since starting CrossFit South Brooklyn. The ultimate goal of this blog is to promote strategies that help affiliates create professional, inclusive, and effective training experiences for their members. The intention of this blog is not to assert that there is a right way to run an affiliate. It’s up to every small business owner to learn from and adapt to their specific communities and environments. I’m simply trying to start a conversation about the things that have worked really well for us, hopefully to the benefit of anyone reading. If you read about something we do and dig it, steal it and find ways to make it better. If you have a different approach to something that’s working for you, please let everyone know about it in the Comments section. To learn more about my affiliate check out the "About" page. Here are three articles for you to start with. Enjoy!